Prevent ankle injuries from happening in the first place. Designed with the athlete in mind, the Aircast A60 ankle brace is ideal for anyone who is looking to prevent an ankle injury. What makes the A60 unique is how it provides the most support at the weakest point of the ankle, thus preventing ankle sprain. Simply stated...wearing the A60 means you're less likely to suffer from an ankle injury. The A60 design incorporates a sleek stabilizer located on either side of the ankle, which is molded at a 60 degree angle to help guard against ankle sprains and rollovers. Comfort is one of the features that makes the A60 one of our best selling ankle braces. Manufactured from Breath-O-Prene material, you'll stay comfortably cool and dry during use. The light-weight anatomic design enhances your comfort because it easily fits in athletic footwear without creating additional bulk. The Aircast A60 is most commonly worn to prevent injuries during sports and other high impact activities. It takes just seconds to apply and adjust the brace to get the perfect fit. Helps prevent rollovers and ankle sprains. You'll enjoy a comfortable, bulk-free fit. This breathable fabric keeps your foot and ankle cool and dry during use. Shop our complete selection of ankle braces or browse additional Aircast products. My daughter plays travel softball and just rolled her ankle, I am looking for a brace that will offer support but not limit her running speed. Which brace would you recommend. The DonJoy Pro Stabilizing ankle. It is designed like an Athletic Trainer would tape an ankle for competition. Limited rolling on either side but allowing for Dorsal or Plantar flexion. I have now rolled both my ankles playing intense tennis (not enough to cause me to stop playing) but I am concerned that I will continue to roll my ankles or have a serious sprain. Not having a significant sprain thus far, is the Aircast A60 the best option? The A60 is a lightweight sleeve with a plastic stay on the outside of the ankle, helping keep the ankle stable and to deter against rolling over the outside of your foot. This brace ios recommended for those with mild ankle instability. I play Ultimate Frisbee and the cuts and running a have to do is pretty brutal on the ankles. Does the brace interfere with running and speed? The design looks great but will it limit my vertical and speed? The A60 is a low profile ankle support and will provide mild-moderate ankle stability without limiting your vertical or speed. I have an ankle sprain from volleyball. I've been using the Airsport ankle brace for the last 7 years and it's wearing down, so it's time for a new brace. Do you recommend I get the same one (AirSport) or try the A60? Airsport Ankle Brace is recommended for athletes who've had an injury not the A60. I'm having problems deciding between the A60 and the Air Sport. I've ruptured two of the three major ligaments in my left ankle. I have major instability problems; my ankle constantly inverts. I'm trying to avoid surgery through physical therapy but I'm finding I need a brace for daily wear. My doctor doesn't want me to wear my Don Joy Velocity as an everyday brace because he wants my muscles to strengthen and work harder to imitate the stability actions of the ligaments I lost. I also have an Air Cast but that still allows my ankle to roll and doesn't provide as much stability as I would like. I'm leaning more towards the A60 because it's less bulky, but I would like a second opinion. The A60 will provide moderate support. I also reccommend the DonJoy Stabilizing ankle. It is more supportive than the A60, but not as much as the Velocity. Do you recommend the A60 Brace for volleyball? The A60 would be a good brace for them if they are only having lateral issues. If they need support on the medial side as well, then I would suggest looking at the Airsport. I suffered a Weber C fracture just over 2 months ago playing Rugby when I slipped and fell awkwardly, dislocating my foot. It was a complete fracture of the fibula about 3 inches or so above the ankle, this required a plate. I also damaged the deltoid ligament which required cleanup surgery and the syndesmosis ligaments which required a fixation screw through the bones. I wish to resume sprinting and Non-Contact Rugby soon after my syndesmosis screw is removed. Would this brace be sufficient in preventing re injury to the ligaments? The scarring/plate in my leg extends to about 6-7 inches from the floor, would this brace cover it to reduce the pain if I was to get direct contact to that area? If not, which brace should I look at? The brace must fit in a football/soccer boot comfortably. The best product for your condition is the Donjoy Velocity ES brace. Should you have any other questions please let us know. Do you know how the A60 works for golfers? I recently had a stress fracture and would like to know if this product will help. Thanks. The A60 is going to give you support on the outside of your ankle to help keep it from rolling. It will give you some support as you walk around the golf course, depending how far out you are from your fracture, you may need to do something a little stronger. If you are just recently out you could look at the Air stirrup Ankle brace for a little more support. If you are further along, the A60 will work just fine. I wear donjoy ankle braces right now for basketball and they are a little bulky but what I like is that they do not allow any inversion or eversion or the ankle at all. The A60 looks lots less bulky but how does it compare to the rigidness of the donjoy for eversion and inversion. The Aircast A60 Ankle Support will only provide support on the lateral aspect of the ankle. The following are a couple of options that maybe less bulky than what you have, but still provide you medial and lateral support. Over the past several years, I have a problem with my left ankle rolling to the outside. The last two occasions of this happening have caused me to fall to the ground in public places. I am now very concerned that this will be a reoccurring and embarrassing problem for me. What type of ankle support would you recommend to give me the confidence that my ankle will not roll? Also, I need a support that fits in an 8 shoe size and will be comfortable for me to wear on a daily basis. I'm am a avid hiker and also work in my garden, so I would like something I can depend upon for support. Janet, thank you for taking the time to email us here at www.betterbraces.com.au regarding your Ankle Injury and getting the best Ankle Brace for your condition. Our Donjoy Velocity Ankle Brace is the best on the market for joint stability and will assist you in keeping your ankle from rolling in and out while walking. Does the a60 ankle brace allow normal movement? I want to stabilize my ankles, but i need a brace that allows full jumping and running movement. Im going to play and practice basketball in this brace. The Aircast A60 Ankle Support allows normal Dorsi-Flexion and Plantar-Flexion at the ankle. It only limits ankle Inversion and Eversion to reduce the risk of injury. It wil not hinder your jumping. I'm an ultra runner and am looking for a good right side ankle support....will the A60 suffice for long distance running? im a size 11.5-12 running shoe, what size would you recommend? 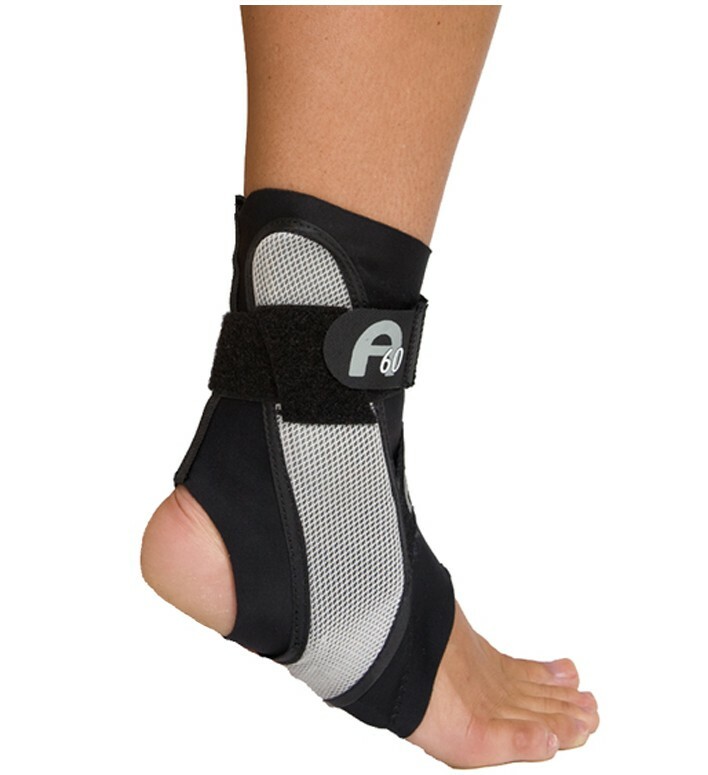 The A60 ankle support will be a good choice for lateral ankle support during running. With your size of foot, I would suggest getting the large size. I play soccer, is the Aircast A60 recommended for soccer use? Will it interfere with my shin guards? I want something low profile. Are these the best support for both my ankles during play? Thanks. Yes, The Aircast A60 Ankle Support is great for soccer. The low profile design will not interfere with your gear and the molded 60deg support will protect your ankle from injury. I have injured my right ankle numerous times hiking due to my weak ankle rolling out and causing injury. Will the Aircast A60 give me the needed support while hiking on the trails irregular surfaces? The Aircast A60 is a great brace to wear while hiking. The 60 degree molded supports help provide ligament support and help prevent ankle rollovers while active. It is light breathable fabric and low profile design fits easily and comfortably inside any athletic shoe. Based on what I read, I have a grade 1 ankle sprain from an inversion that happened around Thanksgiving 2009. I use a Mueller brace (no plastic, just the lace-up with cross-straps) now. I’m still having some issues and wonder if one of these aircast A60’s or the airsport might be better. The sport is tennis. Trying to take it easy but the ankle is just not completely back. What is your recommendation of a brace for tennis? It seems like what causes the pain is more of a twisting motion to the left off my right foot. The Aircast A60 is an excellent Ankle Brace for Tennis and other court sports. In fact, Tennis Pro Andy Murray wears the Aircast A60 Ankle Brace. It fits into a tennis shoe nicely and will give you the stability and protection you need. The support system is far stronger than what you have with the you lace up Mueller Ankle Brace. Is it light weight and can it be worn in any shoe without causing bulk? also I have found that shoe size is hard to find a fit by due to having larger calves, so If I wear a 7.5 womens shoe what size would you recommend. The Aircast A60 is light weight and can be worn in most shoes without an issue. As with all ankle braces there is some bulk added that will require you to loosen the the shoe laces a bit. That is something you'd have to with almost any fairly supportive ankle brace like the A60. For your size shoe you would need a Small. You can see the size chart in the size chart tab on this page. This brace looks like it's made up of fabric...how does it provide support? Is it better support than if I taped my ankle? The Aircast A60 is made of a fabric called Breath-O-Prene which is designed to keep your foot cool and dry. It provides support with the help of a stabilizer located on either side of the ankle (the gray strap in the photo), it is molded at a 60 degree angle to help protect against ankle sprains and rollovers. Cons: Wears very quickly, i have to replace both every 6 months The hard support sides do go down around the bottom of the foot and can cause discomfortable if put on too tight, its a fine balance between too tight and too loose. An amazing product, I used to roll over my ankle ever so often playing tennis and footy. Since I have bought this haven't rolled over my ankle even once. I have had this product for over 3 -4 years now but still works brilliantly. We bought this item for my husband's badly mis-shaped left ankle. The product is an excellent product in that it stabilizes his ankle and allows significantly reduced pressure on his foot. It is comfortable, and he is usually unaware he is wearing the brace. Thank you. After years of chronic ankle issues playing soccer, the Aircast A60 Ankle Brace seems to be working better than everything I've used in the past (including professional strapping tape by a physio). Highly Recommend this product. It provides great support and most importantly gives you a lot of confidence to focus on your game without worrying about rolling your ankles. The only down side would be that the fabric tend to wear down fairly quickly so it will need periodic replacing, but all in all it is a great product! My podiatrist gave me this brace to wear on my ankle because I was feeling mild daily pain due in part to my pronation. The brace combined with my custom orthotics have helped tremendously! This brace is very easy to get on and off, can fit easily into a shoe, does not compress my foot while walking, and is easy to walk, run, bike or hike in. My only complaint is that I need to replace it after about 5-6 months of (nearly daily) wear because the rigid support pieces on the sides are now sticking out of the worn fabric that once contained them. Not only does it look sloppy, but it can get caught on the laces of my other shoe causing me to trip, which is not safe! I have ankle ligament problem. I wear this ankle brace every day to prevent my ankle from turning over, and to ease pain. Without this brace, I couldn't walk alot without being in tremendous pain. A60 Ankle Brace exceeded expectations. My son doesn't mind wearing it. Easy to put on. Highly recommend.